^ 1.0 1.1 1.2 1.3 1.4 Te, Zorine. Call of Duty: Infinite Warfare Release Date, Trailer, Gameplay Details Revealed. GameSpot. 2016-05-02 [2016-05-02]. ^ Hillier, Brenna. Call of Duty: Infinite Warfare trailer kicks off Messenger code game. vg247. 2016-05-02 [2016-05-02]. ^ 《使命召喚13：無限戰爭》PS4簡中版公布 同捆《使命召喚4：高清重製版》. 遊民星空. 2016-05-03 [2016-05-05]. ^ Bratt, Chris. Here's the first trailer for Call of Duty: Infinite Warfare. Eurogamer. 2016-05-02 [2016-05-02]. ^ G. Macy, Seth. Call of Duty: Infinite Warfare Campaign Details Revealed. IGN. 2016-05-02 [2016-05-03]. ^ Futter, Mike. Call Of Duty: Infinite Warfare, Modern Warfare Remastered Finally Confirmed With Trailer. Game Informer. 2016-05-02 [2016-05-02]. ^ Osborn, Alex. Infinity Ward Wants You To Live The Top-Gun Fantasy In Call of Duty: Infinite Warfare. IGN. 2016-05-02 [2016-05-03]. ^ 8.0 8.1 Makuch, Eddie. Why Call of Duty Is Going to Space and What That Allows. GameSpot. 2016-05-02 [2016-05-03]. ^ Osborn, Alex. Call of Duty: Infinite Warfare Side-missions Provide In-game Rewards. IGN. 2016-05-02 [2016-05-03]. ^ Lowe, Scott. Call of Duty: Infinite Warfare – Everything You Need to Know. Activision. 2016-05-02 [2016-05-03]. ^ Makuch, Eddie. New Call of Duty Aiming to Offer Biggest Change Since Modern Warfare, Dev Says. GameSpot. 2016-05-01 [2016-05-02]. ^ Jones, Gary. Call of Duty 2016: Modern Warfare 4 or Ghosts 2? 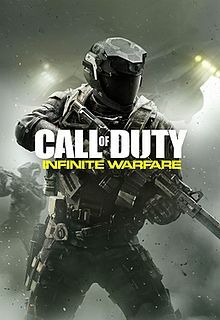 Infinity Ward releasing next COD title. Express.co.uk. 2016-02-12 [2016-05-02]. ^ Tyrrel, Brandin. E3 2016 Next Call of Duty Confirmed For E3. IGN. 2016-03-01 [2016-05-02]. ^ Sykes, Tom. Call of Duty: Infinite Warfare trailer reveals November 4 release. PC Gamer. 2016-05-02 [2016-05-02]. ^ FutteR, Mike. It Looks Like The Next Call Of Duty Game Is Called Infinite Warfare. Game Informer. 2016-04-25 [2016-05-02]. ^ Scammell, David. Call of Duty: Infinite Warfare trademarked by Activision. VideoGamer.com. 2016-04-30 [2016-05-02]. ^ Favis, Elise. Speak To This Interactive Facebook Bot To Reveal Clues About The Next Call Of Duty. Game Informer. 2016-05-01 [2016-05-02]. ^ Scammell, David. Modern Warfare Remastered is developed by Raven; first multiplayer maps confirmed. VideoGamer.com. 2016-05-02 [2016-05-02]. ^ Prescott, Shaun. Call of Duty: Modern Warfare remaster will not be sold standalone. PC Gamer. 2016-05-03 [2016-05-03]. ^ FAQ. 2016-05-02 [May 6, 2016]. ^ Call of Duty: Infinite Warfare for PC Reviews. Metacritic. [2016-11-03]. ^ Call of Duty: Infinite Warfare for PlayStation 4 Reviews. Metacritic. [2016-11-03]. ^ Call of Duty: Infinite Warfare for Xbox One Reviews. Metacritic. [2016-11-03]. ^ Carter, Chris. Review: Call of Duty: Infinite Warfare. Destructoid. 2016-11-03 [2016-11-03]. ^ Carsillo, Ray. Call of Duty: Infinite Warfare review. Electronic Gaming Monthly. 2016-11-03 [2016-11-03]. ^ Tack, Daniel. The Heavy Gravity Of War - Call of Duty: Infinite Warfare - PlayStation 4. Game Informer. 2016-11-03 [2016-11-03]. （原始內容存檔於2016-11-05）. ^ Concepcion, Miguel. Call of Duty: Infinite Warfare Review. GameSpot. 2016-11-03 [2016-11-03]. ^ Hurley, Leon. Call of Duty: Infinite Warfare review: 'Consistent and exciting, albeit without any overtly outsdtanding moments'. GamesRadar. 2016-11-03 [2016-11-03]. ^ Gerstmann, Jeff. Call of Duty: Infinite Warfare Review. Giant Bomb. 2016-11-09 [2016-11-09]. ^ GILROY, JOAB. CALL OF DUTY: INFINITE WARFARE REVIEW.IGN.2016-11-07.[2016-11-11]. ^ Frushtick, Russ. CALL OF DUTY: INFINITE WARFARE REVIEW.Polygon.2016-11-04.[2016-11-11]. ^ Wilde, Tyler. Call of Duty: Infinite Warfare review. PC Gamer. 2016-11-09 [2016-11-09]. ^ Scammell, David. Call of Duty: Infinite Warfare Review. VideoGamer.com. 2016-11-09 [2016-11-09]. ^ Reilly, By Luke. Activision CEO Comments on Divisive Call of Duty: Infinite Warfare Trailer. IGN. [2016-05-09]. ^ Takahashi, Dean. Infinity Ward developers reveal their design decisions for Call of Duty: Infinite Warfare. VentureBeat. ^ Schreier, Jason. People Are Mass-Disliking The Call of Duty: Infinite Warfare Trailer. Kotaku. [2016-05-09] （美國英語）. ^ Mascarenhas, Hyacinth. Battlefield 1 and Infinite Warfare trailers break YouTube like and dislike records. International Business Times UK. 2016-05-10 [2016-05-10]. ^ Koch, Cameron. The 'Call Of Duty: Infinite Warfare' Trailer Is Officially The Second-Most Disliked YouTube Video. Tech Times. 2016-05-17 [2016-05-19]. ^ Lillah, Sarmad. Call of Duty: Infinite Warfare's 3M YouTube Dislikes Didn't Change Anything in the Game, Says Activision | SegmentNext. 2016-06-27 [2016-06-30].